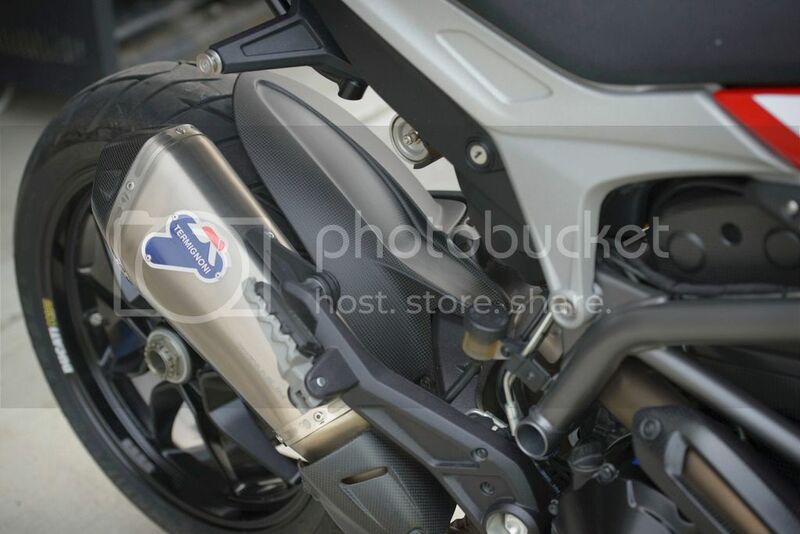 Ok, so I purchased some carbon fiber bits from Superbike Italia (great seller btw) on here, and I figured I'd do a quick and dirty review of the parts. Seems there's not very many review threads for aftermarket carbon bits that Ducati owners seem to love cloaking their toys in... So, I'll start one. I will compare the CarbonWorld parts directly to the Ducati Performance parts in terms of fit, ease of install and finish quality. I cannot comment on shipping times from the manufacturer because obviously as I just stated, I purchased them BNIB (basically new in box). Ok, so that's what the hugger looks like mounted on my 2013 Hyperstrada. You might have noticed that I scored it slightly lower on fit. Following the instructional video that CW created online, using all the supplied hardware the hugger will be loose after you've torqued the three factory hugger bolts down. I quickly determined the reason is because the white plastic spacers (washers) you're supplied with the kit aren't thick enough to provide a firm hold on the part. So, into my spare Ducati parts bin I went, and used 3x 85210721B exhaust washers found on the front exhaust heatsheild. After I put those on, the part was snug. Another few notes, the shape of the fender is different from the Hyperstrada, so you might now notice a little paint rub mark from your factory fender on the top of the swingarm which is now exposed. 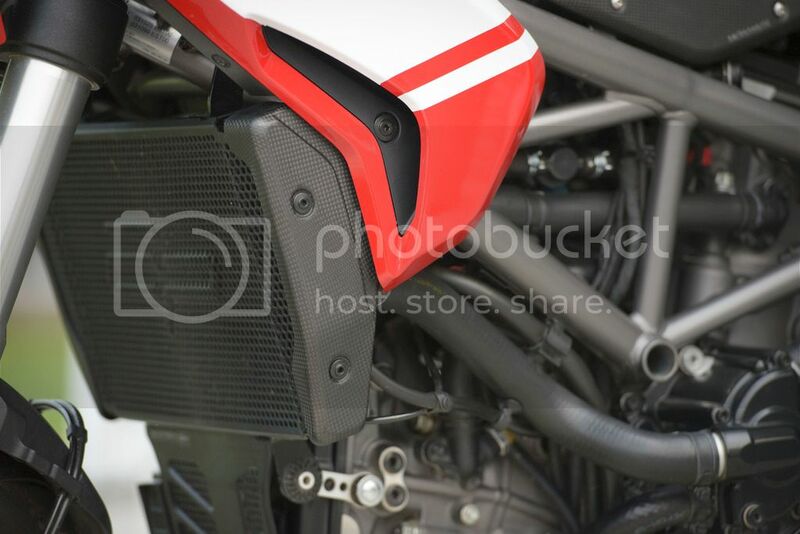 Plus the actual mudguard does not extend up as far as the OEM piece because it's shaped to resemble the Hypermotard unit. So what does that mean.. you might get a little extra tire spray on your back if you live in a wet climate. 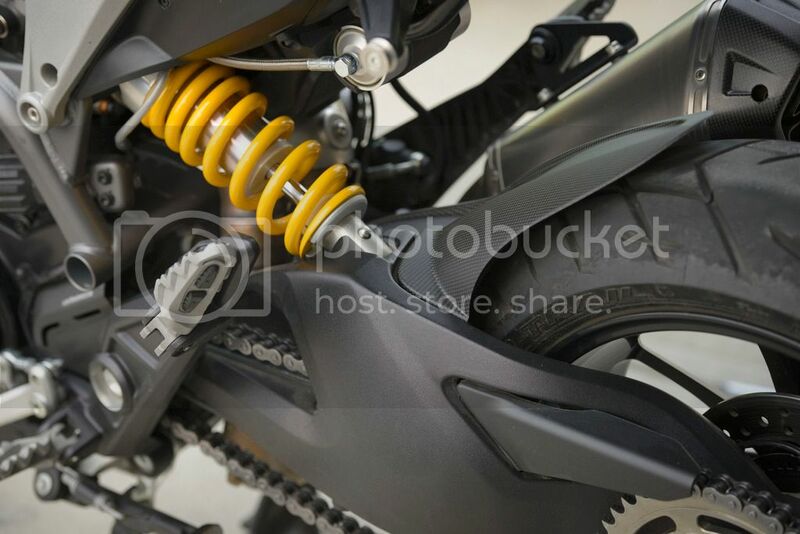 Lastly, there is a gap all around the part where it meets the swingarm, so either you'll love being able to clean your swingarm easily, or it'll annoy you that mud and dirt can easily get between the hugger and the swingarm. It's your call. The part is really nicely built. There's no jagged edges, the weave pattern is good and consistent. It feels reasonably sturdy, and it's extremely light. One note is that the weave pattern has slightly smaller squares than any of my DP carbon bits (Exhaust heatsheild, Timing covers, Windshield). Another note is the parts appear almost more Mat coloured versus the Ducati bits which have a very subtle shine or depth to them. The difference is similar to using mat black paint versus semi gloss.. it's probably due to different companies using different products. Overall great piece. Yes install was fun trying to keep the loose spacers behind the covers on the bolts while you're installing the piece, but it wasn't all that difficult. If you wanted to make it easier on yourself, just a little dab of glue or silicone would've held the spacers in place while you're installing it.. But really who cares, if you follow the video online, you'll figure it out. I did knock it down a few notches on finish quality because you have to use the bolts they supply with the kit.. unfortunately they aren't dark/black coloured so the hardware kinda stands out. Plus, I'm not sure how long the carbonworld decals will last because they're pretty easy to peel, and I'd imagine that your knees will make quick work of that. 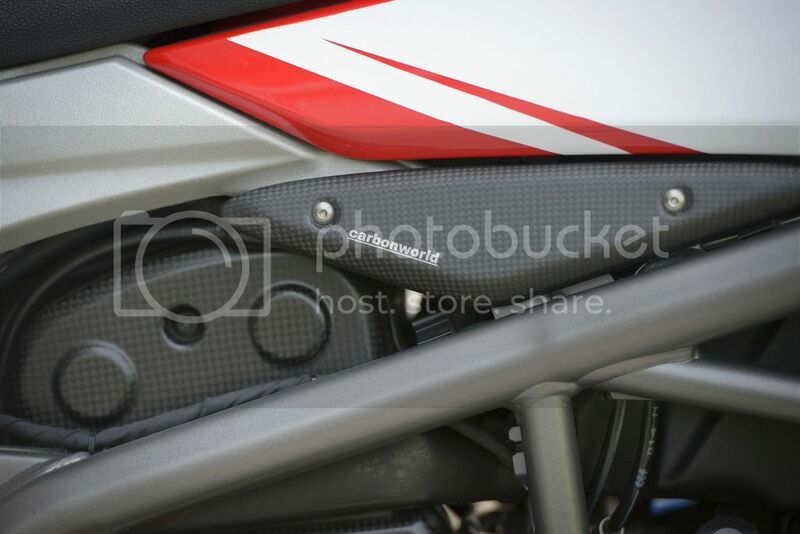 Again, same small gripe about the weave pattern and depth of the finish not really matching the Ducati Performance stuff.. but I can ignore that. This one I knocked down quite a bit in the fit department because I had to pull out my Dremel with a sanding wheel to modify the part so it would fit properly. I had to clearance the top edge to clear the casing in a few spots, and I had to notch the part so the supplied three zap straps had a place to wrap around the part without getting pinched and possibly cut. Install was a use your best judgement because CW didn't make a video like all the rest of the parts. Another note about the install, they include 3 bolts to install it, however the factory bolts are more than adequate in length and shape to do the job. So, instead of having the same chrome bolts mentioned in the frame covers above, I have the factory black bolts securing the part. Again, same note on the finish.. it's pretty close to the DP stuff, but not perfect. There is a video online.. but if you need to use it.. you probably shouldn't be turning a wrench on your bike. Funny thing is, in the video the spacers are loose and you've got to do the same dance as the frame covers to keep the spacers in place.. however for some reason, on the parts I received the spacers were glued into place.. maybe they need to do that to all their parts..
Again, same gripe on the finish, which I suspect would be the same for all of their parts. Overall, all the parts are a great value considering Ducati would like your first born child as payment for their stuff. But, keep in mind... usually you pay for what you get.. if you want that 100% OEM option part look, then go to your Ducati dealer and sign the paperwork.. if you want to save a few bucks, while the part essentially does the same job as the DP stuff.. then look at the CarbonWorld.de parts and save your money so your kids can eat. 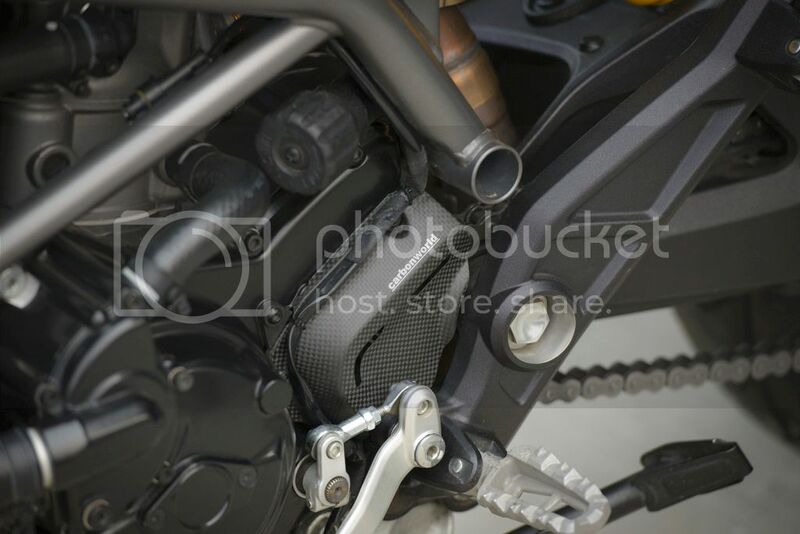 There are a few Ducati Performance Carbon parts that I wouldn't substitute for anything else, one of them being the Carbon Belt Cover. Main reason I say that, if for some reason there is a fit issue that goes unnoticed you could destroy your engine.. but again, food on the table or carbon on the bike... it's your call.